It's winter, which means we have two options: 1.) Stay indoors as much as possible huddled under a mountain of blankets, constantly clutching at a mug of hot chocolate, or 2.) Go outside, have some adventure, and then come home and huddle under a blanket with hot chocolate. 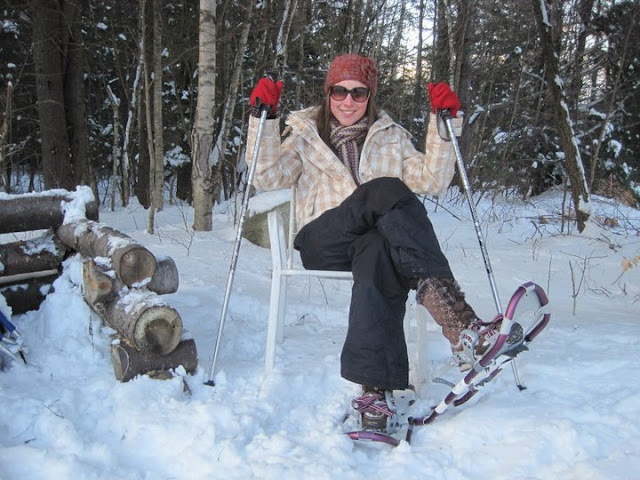 Boots & Snowshoes: These are your most important items! Make sure you wear STURDY, actual winter boots. Fashion boots won't work here...this is an actual sport activity, and the snowshoes need a solid foundation to attach to, so wear a thick-soled heavy-duty snowboot. It's a great idea to have your snowshoes fitted professionally at the sporting goods store, because they vary by length and weight, so you'll want to be sure to get a pair that works for your weight and size. If you're renting snowshoes, they will help you with this when you get there. Socks: You want wool. I can't stress this enough. When it comes to snowshoe gear, socks are important since your feet will be doing a lot of the work and, therefore, you'll be sweating. So wool is key because it wicks moisture and naturally regulates body temperature. Try to avoid cotton which will only trap sweat, cool, and make your feet cold. My favorite socks are DarnTough, but any merino wool sock will work. Base Layers/Long Underwear: I know its not cool to talk about "long underwear" so we'll call it "base layers" and be hip, yeah? Even though it's still totally long underwear. Wool or silk are the best here, as again, they naturally regulate body temperature and wick away sweat, while still allowing your skin to breathe. Trust me, I've tried synthetic base layers. Stick with natural fibers, such as SmartWool or WinterSilks. You'll most likely want a top and bottom. Pants: Ski pants are your best bet. Snowshoeing is hard work, and you might fall in the wet snow. Do not try to snowshoe in jeans; they will get cold, wet, and stiff very fast. Stick with something waterproof and athletic. Fleece Jacket: I love a good, classic Northface fleece jacket. If it is a warm day, this might be all you need, since you're bound to work up a sweat while snowshoeing. But better to have a coat or shell, too. Coat or Shell: If you have a fleece jacket, you may only need a water & windproof shell. Or you may decide to forgo the fleece jacket and wear a coat instead. Whichever combination you choose, remember to keep your temperature regulated, and, if necessary, remove layers or vent layers. Hat or Balaclava: Depending on the day, a hat may do you just fine. Or you may need to add a balaclava (a hood that covers part of your face, too) if it is particularly cold or windy. Scarf: A scarf is a great addition to your outfit, not only for color, but also to pull up over your face and nose if the wind starts to blow or you go through a colder, shaded area. Gloves/Mittens: You may be using poles when snowshoeing if your path is uphill or strenuous, so gloves or mittens with a grippy palm are useful. Otherwise, I personally prefer mittens. My hands are especially sensitive to the cold, and after testing dozens of gloves and mittens, I find my hands are almost always warmer in mittens. A few handwarmer packets might be helpful, too. Sunglasses/Sunscreen: Snow is white. The sun reflects off white things. Directly into your eyes and on your face. Remember to wear sunscreen and bring sunglasses. To help you, I've pulled together an Amazon store of some great winter layering pieces for snowshoeing*. They're also great for skiing, snowboarding, cross-country skiing, sledding, or any other winter sport activity. Get out there, go adventuring, and have fun! Love all of those choices! As cute as they are I think I will be staying inside with the hot chocolate and blankets! No brave enough to be out in the blizzards.